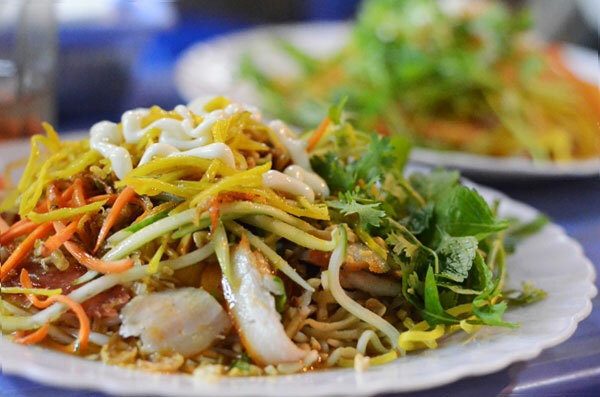 An unusual feature of Vietnamese cuisine is the ownership that people – chefs, restaurant owners, gourmets or just the “common man” – display for a dish, and the stories that they are prepared to share. These stories may or may not overlap, and may even contradict each other, but they never fail to add some spice to the dish that is already tickling our palate. In that spirit, meet 70-year-old Hoang Thi Xuan, a sprightly senior from the erstwhile village of Ngu Xa in Ha Noi, who used to sell noodle soup before one eventful night, many years ago, when necessity mothered an invention. That night, she was about to close her noodle soup shop when a group of men came in and requested a bowl of pho each. “I was very confused because the men were regular and close customers. I wanted to say sorry, because it was too late and that I had run out of the broth. All I had was some uncut rice noodles and boiled beef. “But, seeing that the men were really hungry, I decided to improvise. I wrapped the rice noodles with beef and dill and made a dipping sauce with vinegar, fish sauce, garlic, and chili, which are always there in the shop. Since then, Xuan said, she began making pho cuon, which sold so well that she stopped selling noodle soup. There may be a similar story about yet another dish that the capital city has become famous for, pho chua (sour noodle), but we can be confident one will emerge sooner or later. These two dishes have become star attractions in their own right, giving company to the exalted, iconic pho (noodle soup) that the capital city is justly famous for. Ngu Xa, located near the Truc Bach Lake, was once a craft village dedicated to bronze casting, but its current claim to fame is the pho cuon Street in Ha Noi’s Ba Dinh District. Xuan said that after she stopped selling noodle soup and shifted to her new dish, a dozen neighbors began doing it too, but “we still cannot meet the increasing demand, particularly in summer, because during the hot weather, pho cuon helps to cool down the heat inside the body”. She said pho cuon shops are typically very crowded weekends and late afternoons. “At these times, all my four workers have to work very hard to serve our customers. Each skilled worker can wrap 30-40 pho cuon in two minutes. 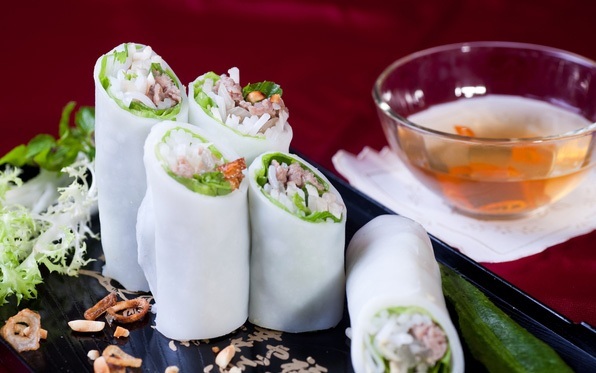 Xuan also said that the rice noodle sheets used must be made as thin as possible, and be a bit crispy to the same time to ensure that the roll is not shriveled. 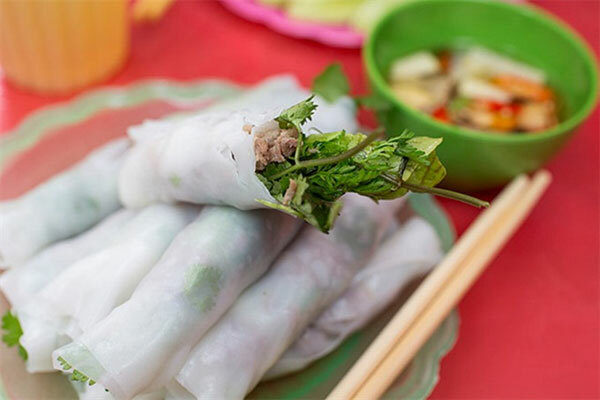 Ho Thi Ty of Nghe An recalled the first time she was in Ha Noi: “It was the first time I had pho cuon. I cannot describe how tasty it was! The pho was thin, the beef fatty and soft and delicious while the dill, the Lang basil, and cilantro added their own flavors and fragrances. I ate a lot, but could not have enough. Pho chua (sour noodles) is said to have originated in the northern province of Lang Son. The credit for bringing the tasty, aromatic dish to the capital city several decades ago is claimed by To Van Dinh, a native of Lang Son Town. Dinh says the dish came into being a very long time ago in his native place. His mother sold it at the Ky Lua Market there. The dish comprises rice noodles, fried sweet potato, roasted pork, fried ground nuts, carrots, and cucumber. Preparing all these is a lot of work, Dinh said. But, he added, the key to this dish being tasty or not is the sauce, a mix of tamarind juice, garlic, chili, honey and several other ingredients. “The dish gets much more enjoyable when diners toss the sauce well with the pho,” said Dinh. Herbalist Nguyen Van Vien of the Ha Noi Hospital of Traditional Medicine, said pho chua helps people with digestion and reduces hypertension. It is very good dish to have in summer, and a bowl of pho chua is rich in protein and different vitamins, he said.